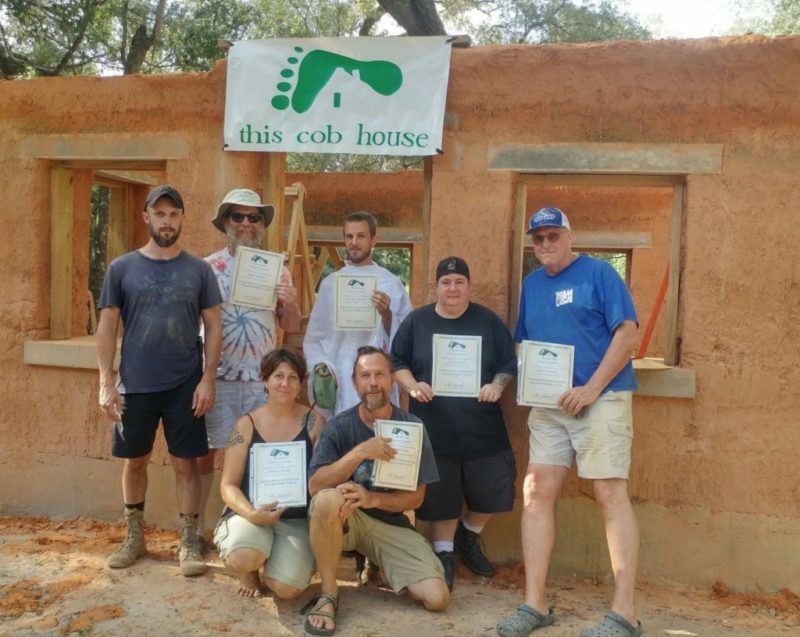 Cob Workshops Upcoming Events : : Build the First Cob Permaculture Boutique in Senegal, West Africa! Build the First Cob Permaculture Boutique in Senegal, West Africa! Our brand new hot-off-the-press cob workshop is taking place in Toubab Dialaw, only an hour south of Dakar and the airport. Toubab Dialaw is one of the most enjoyable beachfront villages in Senegal, hosting a fabulous mix of cultures gathered around music, art, dance and now, natural building and permaculture. CruzinCobGlobal has already held 2 workshops in this area and built 4 cob ovens this year as well as trained a dozen Senegalese cob builders! Elisa Badoux from Belgium and her partner Malick want to start the first Permaculture and Ecology Center in Toubab Dialaw and La Petite Côte to educate the local population and visitors as well as offer a center for showing films and videos, hosting speakers, holding workshops and bringing together producers of local agroecological goods to work and exchange ideas in community, as well as offering them a place to showcase and sell their products. 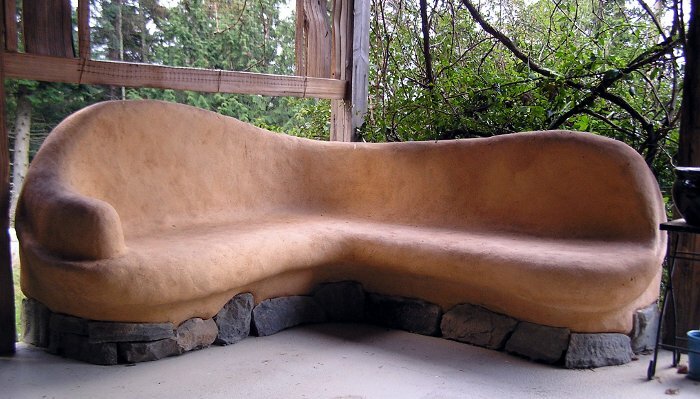 What better way to showcase natural building than to build the boutique out of COB? Toubab Dialaw is a short one hour ride from the Dakar International Airport on the new highway. It is a well-visited and appreciated beach town with renowned art hotels Sobobade, l’Engouement and La Source and hosts dance and drum classes on the beach every day. Artists choose this area for its bustling creativity. Students have a choice of being housed in Elisa and Malick’s home in one of 3 bedrooms with multiple beds to make it more economical if desired. The rooms are 7000fcfa or about $12 a night and can be shared with up to two other people. A local cook will make meals and students can choose which meals they want to have. Rooms at a reduced rate are available at the Sobobade and La Source Hotels which are right on the beach. Elisa and Malick’s house is a short 10-minute walk to the beach as well. The site is also very close by and an easy walk from all housing options. Pickups from the airport can be organized by local drivers for an additional fee. We will build from 9 to 1:30 daily, followed by lunch and an hour lecture/discussion time. Afternoons are free for beachtime, exploring or drum and dance classes. We will have class every day for the full 16 days and students are always welcome to take time off and rest. 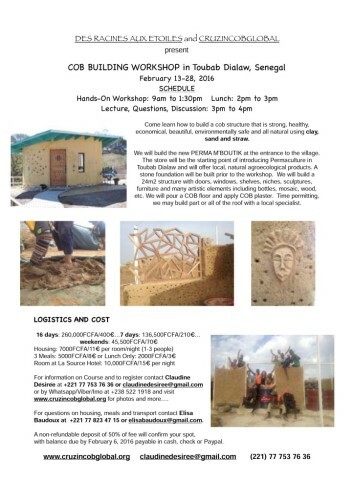 A few field trips to local cob and other natural building sites of interest will take place during the afternoons. 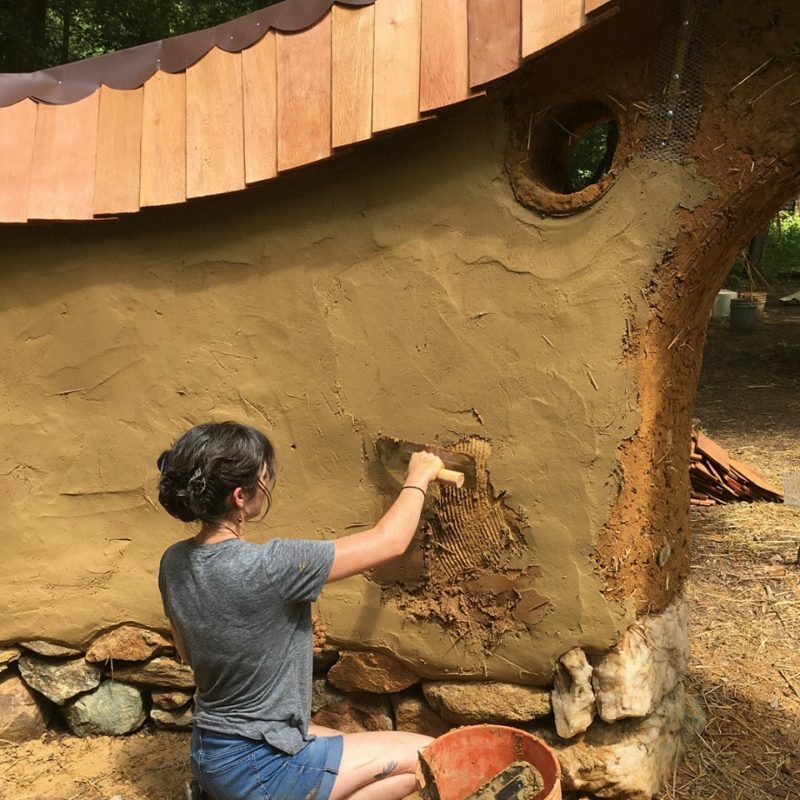 Students will learn everything they need to know to build a house out of cob walls. Lectures on foundation and roof will be included, though the foundation will be built beforehand and the roof may be included if it works out. Payment can be made using Paypal (international and US residents add 4% processing fee)or Venmo (free and for US residents only). Local residents can pay in cash or check. A bank deposit into a US bank can be made as well for no fee. Final cost will depend on room and board plan as well as airport transfer option. Tuition is $440 for the 16 days or 400€. Please email Claudine to register and organize payment. A 50% deposit is required to confirm your spot in the Course and the full balance should be paid by February 6. Feel free to visit the Gallery page and our Facebook page to see the photos from the most recent Senegal workshop only a few miles away.